Modern Dance, Opera, Theater, we have them all. 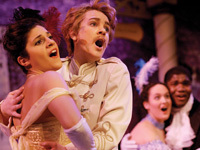 Find the type of performing arts that you want to see in MA in our guide. We have a complete and detailed list of the best MA performing arts companies. Whether you are looking for a relaxing evening at the ballet or a fun night laughing at a comedy play, you will find what you are searching for when you look through our guide. If you are looking to see the best MA ballet performance check out our detailed guide. We list all of the best ballet shoes Massachusetts has. When you visit Massachusetts make sure you see one of the amazing opera performances held. You will be left breathless after watching one of these operas in MA.